By Abi - Turkey - 20 Oct/03 - Viewed 1608 times. We arrived in Istanbul and were able to find a relatively cheap hotel that gave us a discount for staying for 6 nights. The first order of business the next day was to find a dentist for Travis. He had been suffering from a severe toothache for several days and it was really becoming a problem. We wanted to get it taken care of before we went to Egypt and got into a country with even more questionable medical facilities. The owner of our hotel, Hamid, recommended a dentist to us that was right in the area. First, we decided that just in case this dentist didn't speak English, we would ask the concierge at the Four Seasons Hotel (right around the corner) what he would suggest. We stopped by there on our way to the first dentist and the concierge recommended we go to the American Hospital, where we could be assured that they spoke English, although it might be a little more expensive. We quickly found the first dentist and his office was so tiny that he didn't even have room for an assistant...he was the assistant, receptionist and likely the electrician. He immediately put Travis in the seat and we showed him in the phrase book where it said he had a toothache. He started thumping on the teeth with instruments, causing Travis some pain! Along with the grunting, pointing and thumping on the teeth, he quickly assessed that Travis had an abcess (fortunately also in the phrase book) and prescribed an antibiotic (all of this took no more than two minutes). By this time there was so much gesturing, pointing to the calendar and general confusion, that we thanked the gentleman, who would take no payment, and decided the situation was serious enough that we needed to have a dentist that spoke English take a look and tell us what was going on. Luckily, we had had the foresight to make an appointment with the American Hospital in case this guy didn't work out and were set up for 2:00. Thinking that we could walk there and get some lunch along the way (in case Travis couldn't chew afterwards), we spent our time enjoying the area and scenery, until we realized that we only had half an hour and we didn't have any idea where we were. We found a cab and pulled up to the hospital with just a few minutes to spare for the appointment. The doctor was a very nice woman who spoke good English and put us at east right away. We knew the initial cost would be 80 million lira (about $60), but really had no other choice. She initially said she couldn't find anything, took x-rays (another 20 million), but said there was nothing seriously wrong, other than the gums receding a bit, causing a little sensitivity to the nerves. Ironically, the tooth hadn't been bothering him for the last two days or so, but we wanted to make sure there was nothing serious. She put a bit of flouride on the exposed area and sent us on our way. We told her the story of the first dentist and she was glad we had come here, saying she wouldn't go to any doctor in that particular area. The rest of the day was spent by doing laundry and browsing in a Foreign Book Exchange which had a great selection. The next day we decided to visit some of the sites and decided upon Aya Sofia Mosque first. 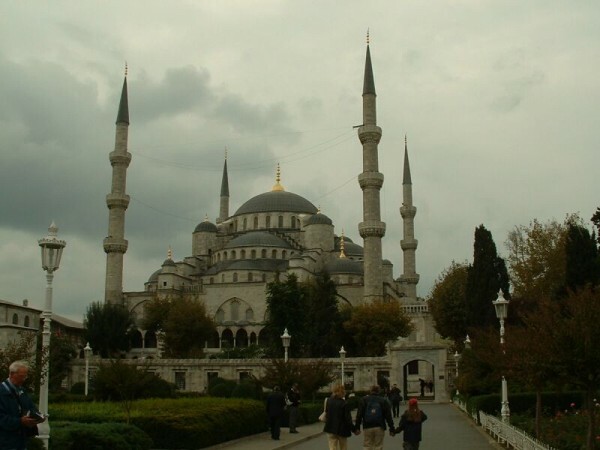 A nice young man in khaki pants and a blue blazer came up to us, asking if we spoke English and suggested that we should visit the Blue Mosque first, as it would be closed in about an hour for prayer time. He walked along with us, pointing out interesting tidbits, and it was about this time that I thought he wanted to be our tour guide for the day. Just as I was about to tell him we weren't interested, he says he enjoys practising his English, he doesn't want any money, but maybe he could give us his family's business card. Meanwhile, Travis is taking pictures as the young man politely stops and waits, giving information the whole time. At this point, we tell him that we would like the business card, but we don't want to take any more of his time. He says he doesn't have the business card on him, but would be glad to wait for us while we are viewing the Blue Mosque and then give us the card afterward. We tell him that's not necessary, but he insists. The Blue Mosque is a very lovely building, and the mosaic tiles on the inside are exquisite (and mostly blue, hence the name). However, it is just basically an open room and there is really only so much time you can spend in there without becoming bored. When we emerged, of course our friend was there waiting for us! I realized at this point, there is no business card. He was taking us directly to his family's store, which we quickly saw was a carpet business. Ushered up the stairs, and deposited into his brother's hands who quickly offers us Turkish Tea, Apple Tea, and then starts in on describing the different kinds of carpets, what makes them quality and on and on. Finally he asks which one we are interested in so he can show us different sizes and go into even more detail about whichever kind we liked (there are wool on wool, wool on cotton, silk, silk and wool, silk and cotton, and kilim to choose from). We try to say we aren't interested but he insists that price is no problem, they have all carpets ranging from $60 to $5000 and which size do we like. When we said we didn't know the size of the room, he says they will go in any room. When I tell him I have brightly painted rooms that are very different, he says if it's dark, it picks up such and such a color. If it's light, it picks up that color. Finally, Travis pointed to a silk rug which I didn't care for at all and I picked out a completely different one. We figured out that if we said we couldn't agree on which one, that he didn't have a comeback line for it. Finally, after an exhausting 45 minutes, we were able to extricate ourselves without paying either $350 (for the one I liked) or $2000 (for the one Travis liked). What a relief. We decided from that point on, we were not talking to any more young men who "wanted to practise their English"! Travis even considered responding that he was allergic to all types of fibres: wool, cotton, silk and natural dyes! The sheer number of carpet stores here is amazing. Next we went to the Grand Bazaar. This is where we planned to do our Christmas shopping for our family and friends and send a couple of packages home. There are over 3,000 booths in this bazaar and it is completely overwhelming when you walk inside. People are calling you from every direction: Hello, Lady, would you like to come into my shop? How about some beautiful leather? Would you like a purse? Where are you from? Welcome to my country. Is it my turn now? How about a beautiful carpet? I have one you haven't seen yet. Can I offer you some Turkish Tea, Apple Tea? and on and on. It was a little bit much at the beginning, but you quickly get acclimated, don't let your eyes rest too long on anything and, if there is something you really like, pretend you are looking down at the map and point it out to your spouse to see if you want to start the haggling process! This is one of my favorite sports and I feel I am fairly good at it. We got a lot of things for very good prices and had a great time. We spent several hours here over a three day period. It's amazing what they will do for you when you start to walk away. One guy even told me, after agreeing on a price, that I drove a really hard bargain. But, if they agree to it, you know they are still making a decent profit, otherwise they wouldn't agree since there is somebody else coming behind you willing to pay more. The weather was not very good while in Istanbul, being very cloudy and rainy until the day we left. I won't bore you with all the details, but suffice it to say that getting around in Istanbul is not the easiest thing in the world. It is split by the Bosphorous Strait and going to one side or the other involves a ferry, walking a long distance, or getting a bus. One day we were deciding what to do: a day trip to Iznik (which we learned was 4 hours one way, so that was out) a ferry cruise down the Bosphorous, or visiting a summer palace of one of the sultans that was a bit out of the way. We decided on the summer palace, which was beautiful. You were only allowed to take pictures if you paid an additional camera fee of $8.50, so we declined, but it whet our appetite for Topkapi Palace, which is even more impressive. Later in the afternoon, we took the ferry cruise down the Bosphorous, but it was so rainy and foggy, we almost couldn't see much of anything. It was a frustrating day, taken up mostly by transportation from one side of Istanbul to the other. The next day, we visited Topkapi Palace, which is where the Sultans lived until the 1800s. It included a Harem, complete with rooms for up to 400 concubines and wives, eunuchs to serve them and where the Queen Mother ruled (the mother of the Sultan). It was a fascinating look into the lives of these people. There were acres of gardens and grounds to view and we spent the better part of a day touring all around. Later we visited the Grand Palace Mosaic Museum, which I felt was the most interesting place in all of Istanbul. In the 1950's, some archaeologists discovered a passage several hundred feet long with mosaic stories along the walls and floor. It was in terrible condition, but has been beautifully preserved and dates to 500 A.D. There are hunting scenes, warriors, maidens, and even mythological characters that are incredible. We only had about an hour there before it closed, but were fascinated by the designs and creativity produced so long ago. That night we decided to enjoy a little of the Turkish lifestyle and went to a place where we could smoke a water pipe (apple flavored tobacco) and enjoy playing several games of tavla (backgammon). Our last day was taken up with another trip to the Grand Bazaar for some last minute items, and the logistics of finding the best price between the Post Office or UPS (Post Office, by far, especially if it goes by boat, which takes a month). Hamid has been very gracious to allow us to hang out in his common room until our flight at 10:00 p.m. to Cairo.